This last month I've been focused on one thing: getting a television channel going from scratch to on air in 6 weeks. I’m leading the team and my to-do list is long and detailed. One moment I’m choosing channel logos, the next I’m hiring a new producer, and a few minutes later I’m writing a treatment for a new show. When I sit back and look at the big picture, and see how much still needs to be done, I become overwhelmed. I see this task as impossible. But when I focus on the next thing to be done I begin to think this channel will get on air if I just tick one task off at time. And through it all I’m beginning to understand why Jesus spoke these words in Matthew 6:34, why he told us to give our entire attention to what God is doing right now, and not stress about what happens tomorrow. There is so much in our lives that we can’t control. We can give our focus to fear and anxiety or feelings of inadequacy or we can allow ourselves to give our attention to what God is doing right now. We can believe that right now he's with us and giving us everything we need to make it through the hard stuff right now. That in this moment God is teaching us to focus on how he is helping us through life and as we do that we'll learn to cope. And in doing so, he is reminding us that our fears for tomorrow, and worries a month from now, are not where our attention should be. Our eyes should be on God, and when they are, we’ll make it through whatever hard thing comes, because he’ll be holding us. 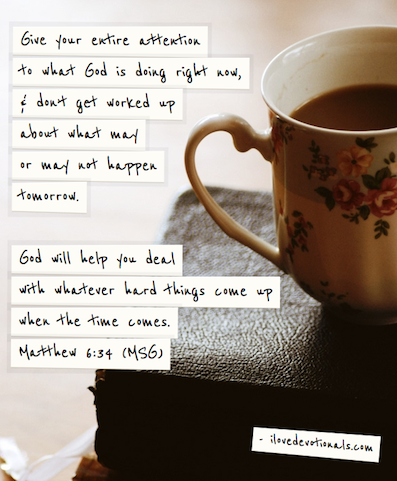 And with him as our focus we can handle whatever is thrown at us: one day at a time. What are you worked up about at the moment? Take a minute to pray and ask God to show you how he is helping you through these hard times. If you liked this devotional & you’re not yet subscribed please sign up here to get new devotionals emailed to you or tweet about it or share it with your friends on Facebook. A version of this devotional originally appeared on GatewayNewsZA.